Probably like many of you, I have read the arguments both for and against alignment changes in a module and have formed my own opinion of how much of an impact they should have in a game. For myself, I concluded that a module that supported decisions of a conscience added extra depth to role-playing, and especially to those character classes that were based on such. However, I also concluded that changes in alignment were most practical (in terms of game play) on the good-evil axis compared to the lawful-chaotic one. After all, determining whether an action is chaotic or lawful is sometimes difficult to ascertain and more subjective than determining if an action is good or evil. Of course, even determining when an action is "good" is subjective, but at least its reasoning is more intuitive than the former. Before now, little emphasis has been placed on clerics keeping true to their faith. In PnP D&D, a cleric could quickly lose the support of their god and spoken prayers if they strayed too far from their chosen alignment. In Better The Demon, this requirement to stay true to the faith has been reinstated for clerics. In other words, if a good aligned cleric commits too many evil acts, thereby turning them evil, then support from their god will be withdrawn. In such a lost faith state, they must then either find a way to recover their faith ... or even switch to a different faith! Whatever the situation, a cleric must be sure to live their faith according to their belief if the party are to benefit from his or her healing and other such prayers. There are exceptions to the above, already alluded to: For instance, for good aligned PCs, killing an evil soul (non innocent) or being authorised by a recognised good and lawful authority to acquire (steal) an item will not be considered evil acts. Indeed, in some circumstances, ridding the world of an evil soul can even help shift alignments towards good and lawful. For the evil aligned PC, however, any killing will always be considered a selfish and evil act, even if killing another evil aligned character. They cannot turn "good" this way, if that is ever their aim for any reason. In Better The Demon, a PC can sacrifice items of value at altars to help offset any detrimental shifts in their intended alignment goal. There are three types of altars available (good, evil and neutral), but only the good and evil altars shift a PCs alignment with a valid sacrifice, although all altars offer other benefits regardless of the PC's current alignment. When used, associated lawful shifts are known to accompany good alignment changes, whereas sacrificing at an evil altar attracts chaotic alignment shifts. As far as play is concerned, the focus for the player is towards either a good or evil path, with law or chaos alterations as a secondary concern, subject to the class of the PC. Where alignment choice is more to do with a single overall life path focus, influence alterations simply represent how a relationship with a certain creature (PC or NPC) are going at any given time. In this sense, you could be playing either a good or evil aligned PC, but depending upon the mood of your PC towards a character at any given encounter, both your response at the time and the resulting influence with said character may change - without affecting your alignment! Again, there are exceptions to this. For instance, lying is not considered a "mood" choice, but a deliberate intention to deceive the listener. Such action would be considered evil (and possibly chaotic) and cause an alignment shift accordingly. However, simply being "blunt" rather than "polite" may affect its listener differently. Some characters may perceive a "blunt" response as honest, decisive and to the point and another the "polite" response as sycophantic. In such situations, the player must determine how best to treat the character and respond as they feel fit. There may be no right or wrong way to respond (from the perspective of alignment changes), but does allow the player to develop their PCs in a way they prefer. If the characters they speak to react adversely to this, then it is up to the player to decide how best to handle it. In Better The Demon, both alignment and influence shifts occur party-wide. 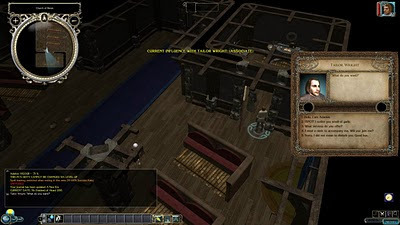 Be it as a party of a companions in a single-player game, or a bunch of players and companions in a multi-player game, the action of one PC will affect the alignment of the party or influence of a character with the rest of the group. In this sense, the actions of every PC impacts on the rest of the party. So, do not be surprised if the paladin of your party reacts to the rest of the group if they allow the rogue in the party to steal from a chest. There will be repercussions for your activities and so careful consideration for your party's role in the game will be important and something to consider as you make your way through the game. If you haven't voted in the poll yet (on the left hand side), then please do and feel free to comment. Alignment changes are an important piece of roleplaying. Actions should have consequences and they should effect your character. You mention that alignment shifts are subjective and that is very true; I have been baffled by some changes while playing different mods on the vault. If you have a set way of choosing actions to cause changes and they are presented to the player before hand, a readme txt, then there should be too much issues. I have placed numerous changes in Risen Hero, most are on the chaos and law spectrum. On the good and evil spectrum I attempt that must shifts I have added are towards evil with little redemption. For the rest of this comment I am going off subject to an older post. Your Pet hates and your poll. I have written up a large response but somehow it didn't get posted so here is a shorted version of the same thing. I voted for interaction, more with a focus to detail. The first part is visual detail. This is area creation. A game must be more then must a bland landscape or redundant tiles. There are members of the community that take the visual detail to an extreme and make everything we do seem far insuperior (Jclef and chaos wielder for example). Areas need to be visually interesting with small details added. Good, I will help you for all of humanity. Neutral, Yah, I'm going that way anyway so I'll see what I can do. Evil, Eat sh*t and die. Another part of conversations are companions, if they are included. They must have definite personalities and react to the PC actions. A paladin companion should have a negative reaction to evil actions while an evil companion should offer some resistance to helping the weak and unfortunate. The last part (at least for this comment) is the descriptive details. Anything that the player can interact with must have a description. It drives me crazy when I examine something and there is “nothing special” about it. Please even if it is a mundane nothing item add some description and avoid the default nothing description. In the first paragraph it should be: a readme txt, then there shouldn't be too much issues. hehe gotta admit that line about he garlic in your screenshot had me giggling. Hard for me to pick one thing from your poll to vote for - but if it's anything, I guess is lack of consistent atmosphere that puts me off. I cannot stand several mods where the story sets out a fantasy setting but then the dialogue is too modern, and especially when its too snarky and just the author's voice for the PC rather than anything else. Anything the breaks the immersion of getting me into and staying with a mod is a no-no. So I guess that's credibility. That said, it'll often depend on my mood at the time of play. Sometimes you just want to kick back and hack and slash, no matter how much I enjoy strong stories. I hope to produce a gaming manual with the release of the mod if all goes to plan, but I agree that a "readme" is a minimum to help prepare the player. I really hope I manage to create areas to at least a degree where they do not come across as too bland. This is definitely my weakest area. However, I hope to counterbalance this weakness with more interactivity. i.e. While an area may appear to lack some detail, the detail it does have has more things that can be done with it than just a pretty picture would. That's the plan anyway ... and I do hope my area designs don't look too bad. As far as conversations go, I have tried to ignore the "standard" approach of good, neutral, evil response (in most cases) and go with "character/mood" responses instead, which is what will affect the Influence of the character being spoken to. Be this a PC or an NPC, every important character has an Influence score. and there will certainly be "trigger" points that occur if the player does something very much against the companions own personality (alignment or influence). Descriptions will be as varied as I can make them, with as many altered as possible. Only very "obvious" items may be ignored, but even this is unlikely. I did make the poll a little more vague than usual in the hopes it might encourage more detailed comments. Im not sure why people refer to that text UI as the overland map gui... isn't it the same as in the regular areas anytime in SOZ? No, the GUI used here is wider than the standard SoZ conversation GUI. As far as I am aware, this GUI was only ever originally used on the overland map, hence its reference.